Research has shown that expertise involves a complex interaction between knowledge attained through repeated experience in a specific activity, and cognitive processes that relate situational information to such knowledge structures (Martin et al, 1989). A novice, due to a lack of experience, has less knowledge and exhibits a diminished ability to relate their knowledge to situational occurrences when compared to experts in the same domain. Pope et al (1974) carried out a study to examine the difference in interviewing abilities between sixteen professional psychiatrists and sixteen students studying Psychology, who had no prior experience in interviewing a patient. The 16 interviewees were each interviewed by a professional and non-professional; after each interview, the interviewee was required to complete a post interview questionnaire designed to evaluate performance. The results of the study indicated that novices were rated as being more accepting and friendly than the professionals, but didn’t possess as much skill or experience and were more anxious, producing more fluttered speech and hesitations. These results suggest that experience provides the expert with more confidence in their abilities, which translate to being more productive and competent in their work when compared to novices. A later study conducted by Martin et al (1989) also examined the differences between experienced psychologists and novices, but focused instead on the cognitive processes and strategies that relate situational information to learned knowledge. The study included 11 experienced counsellors and 12 novice counsellors who were each required to conduct six 55-minute psychological sessions with two patients. After the second, fourth and sixth sessions, both groups of counsellors were individually required to complete a Cognitive Mapping Task (CMT) in order to generate a semantic diagram of how they conceptualised their psychological knowledge and related it to their assigned patients. It was found that the experienced counsellors produced less cluttered and more efficient concept charts compared to the novices; this suggests that the experienced psychologists are able to access and organise their knowledge, and relate it to their patient’s problems more effectively than the novice psychologists. 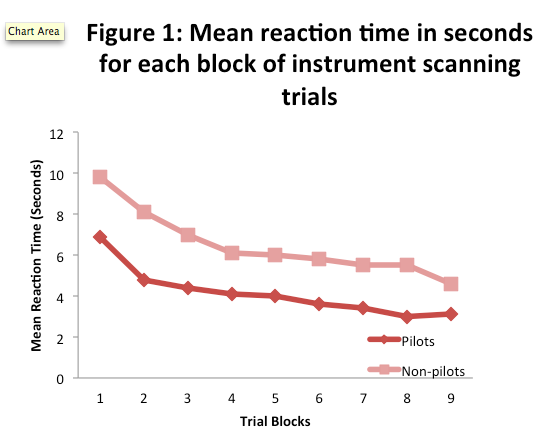 Figure 1 outlines the mean reaction time in seconds that the pilots and non-pilots demonstrated on each of the nine blocks of instrument scanning trials. The IV is labelled on the Y-axis as ‘Mean Reaction Time (Seconds)’ and has a range of 0-12 seconds in 2-second intervals, while the DV is labelled on the X-axis as ‘Trial Blocks’. Figure 1 demonstrated the pilots’ experience advantage over the non-pilots as they had achieved faster reaction times consistently throughout all 9 trial blocks. While the non-pilots never achieved quicker times than the pilots, they did show a gradual drop in reaction time over the course of the trials. 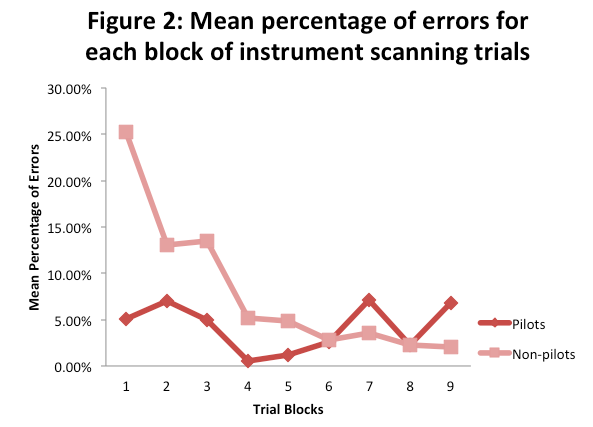 Figure 2 shows the mean percentage of errors that the pilots and non-pilots accumulated during the 9 trial blocks. The IV is labelled on the Y-Axis as ‘Mean Percentage of Errors’ and has a range of 0-30% in intervals of 5% The DV is labelled on the X-axis as ‘Trial Blocks’. Figure 2 illustrates that the non–pilots initially averaged 20% more errors on the test than the pilots, but dramatically improved after each subsequent training block. Interestingly, both the pilots and non-pilots shared the same mean percentage of errors on the 6th and 8th trial, and the non-pilots outperformed the pilots on the 7th and 9th trial. Fahle, M., & Daum, I, (2002) Perceptual learning in amnesia. Neuropsychologia, 40(8), 1167-1172. Martin, J., Slemon, A.G., Hiebert, B., Hallberg, E.T., & Cummings, A.L. (1989) Conceptulizations of Novice and Experienced Counselors. Journal of Counselling Psychology, 26(4), 395-400. Pope, B., Nudler, S., Vonkorff, M.R., & McGhee, J.P. (1974) The experienced professional interviewer versus the complete novice. Journal of Consulting and Clinical Psychology, 42(5), 680-690. Seitz, A.R., Nanez, J.E., Holloway, S.R., Koyama, S., & Watanabe, T. (2005) Seeing what is not there shows the cost of perceptual learning. Proceedings of the National Academy of Sciences of the United States of America, 102 (25), 9080-9085. This entry was posted in psychology, psychology report and tagged era, expert, novice, perceptual learning, psychology, report by Michael Cunningham. Bookmark the permalink.